I am an amateur sound engineer still learning the ropes in church. 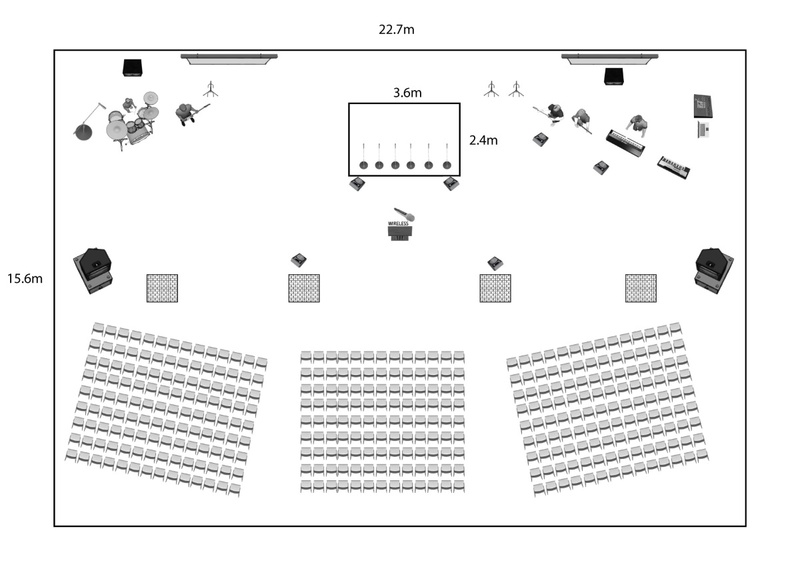 We have a conference in 2 weeks and I just got the specifications of the hall. Can you guys please assist me with where I should place the speakers and subs for this event? The seating will be around 300 people. Those 4 shaded squares in the middle of the hall are concrete columns (IDK poor design skills when constructing?). We are covering them with curtains. It depends on the cover of the speakers. I would say for most "general speakers" (90*), your current placement would be a good starting point. It will be louder close to them, but there is not much you can do. You either give up coverage or SPL evenness. I would rather have coverage and have everybody in the pattern, than have some people where the sound is dull. Welcome to the Forums! You will find a wealth of knowledge and information here, some of which has already been shared with you. However, per the Rules of Participation posted at the top of each page and when you registered, your Display Name does need to be your Real, Full Name in order to join in the discussions. Would you kindly pop back into your Profile and update your Display Name to reflect your Real, Full Name? We're regrettably unable to continue this discussion until you comply! Have you only got 2 FOH speakers? Could you have 4 smaller (more unsightly to the audience) and then have 2 were the FOH currently are and the other 2 in front of the centre columns? Welcome to the forum also. As pictured if you add the two in the middle two support columns you will need to keep them down in volume to prevent slap echoes. Along with the fact that the timing will be off from the L/R because of the distance. Creating added reverb and lowering the clarity.